Each Sunday, the children collect the “Noisy Offering” during the worship offering time. The collection of coins from churchgoers and the clinking sound made in the large metal bowl as the children drop off what they’ve gathered bring smiles to both the children and the adults. 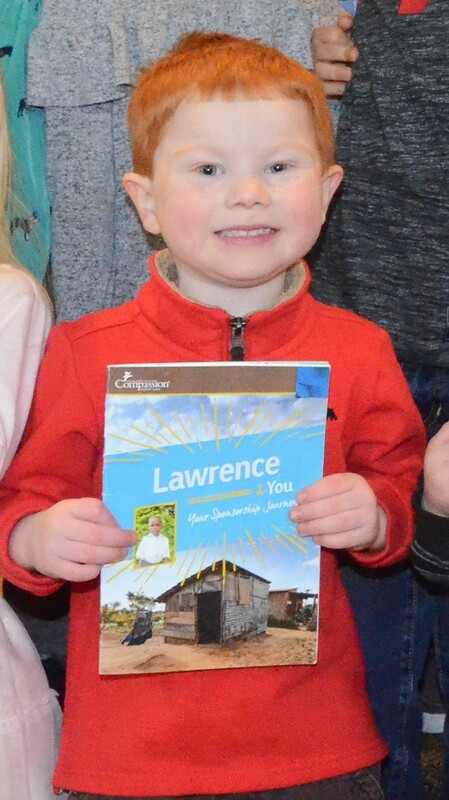 Last October, the children of the Martin Luther Lutheran Church Sunday School decided to begin sponsoring two children through the Compassion International Program with the funds collected with the “Noisy Offering”. Compassion works in 25 countries around the world, partnering with local churches. At the Compassion Child Development center ran by the local church and volunteers, the sponsored child is provided with Bible studies, health screenings, health and hygiene education, games, community service opportunities, counseling, and school fees. The center staff will also provide meetings and parenting education for the parents or guardians of the sponsored child. The Sunday School Children are sponsoring Milkah from Kenya and Lawrence from Uganda. They are proudly holding up pictures of their sponsored children (above) and also a letter. 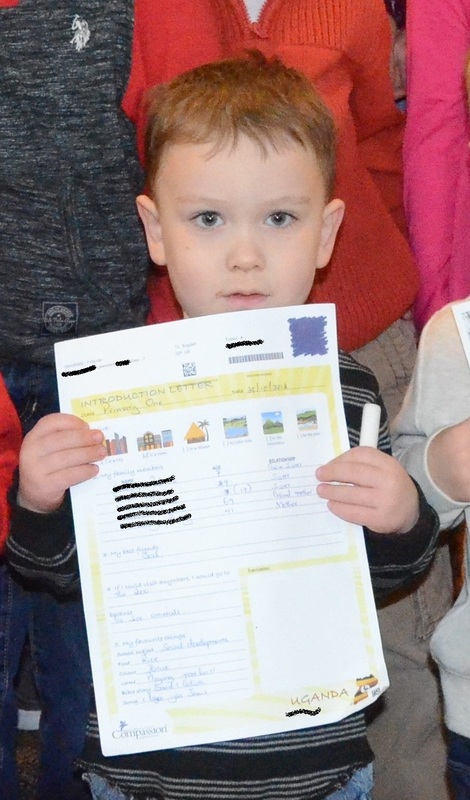 They sponsored children are encouraged and excited to get letters from their sponsors and the kids at MLC have already sent a letter. Milkah is from Korogocho which is one the eastern edge of Nairobi. She will be turning 5 next month. Typical houses in Korogocho are constructed of corrugated iron and have dirt floors. The regional diet consists of maize, beans, kale and potatoes. Common health problems in this area include HIV/AIDS, malaria, malnutition and typhoid fever. Most adults in Korogocho work as petty traders and earn the equivalent of $34 per month. 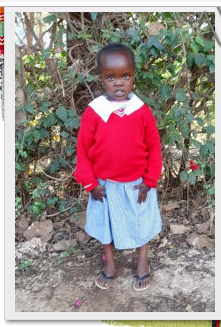 Milkah does not yet attend school but when she’s old enough, the sponsorship provided by MLC Sunday School Children will provide her with the school fees needed to attend school. Lawrence is from the Entebbe area of Uganda. Typical houses of this area are constructed of cement and have corrugated iron roofs. The regional diet consists of maize, beans, bananas, fish, cassava, greens, potatoes, rice and posho (cornmeal). Common health problems in this area include malaria, respiratory tract infections, eye infections and dental cavities. Most adults work as market traders and earn the equivalent of $80 per month. Lawrence helps his father and his mother and his siblings with the daily chores. 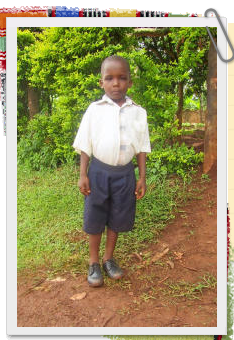 Lawrence goes to school and is in the first of his Primary School years. He has three older sisters and also a twin sister. 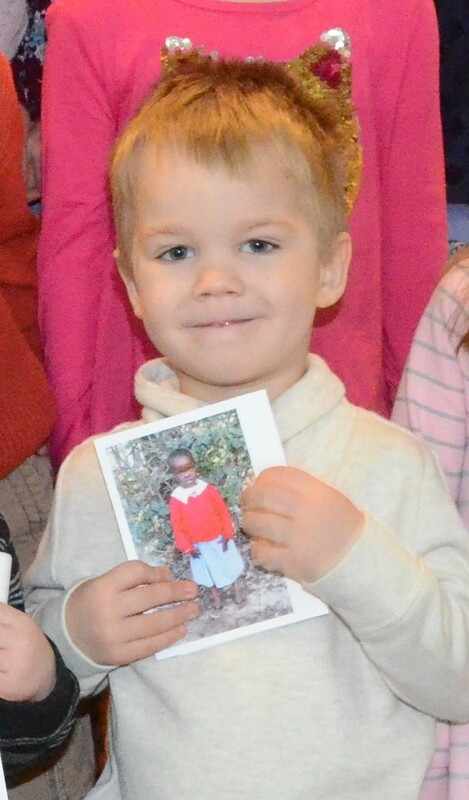 Recently, the Sunday School children sent each child an additional $125 gift for their family. Staff at the Compassion Center where the children attend will help the families determine where the funds will best be used for the family needs. The MLC kids look forward to the relationship they will be building and the encouragement they can provide to Milkah and Lawrence. MLC children will remember in their prayers two special sponsored children half way around the world!